It’s been too long since I posted anything on here, I have been a bit preoccupied lately with finding a new home. Now settled in and enjoying the comforts of a nice flat with a better equipped kitchen than the last one (the kitchen is, after all, the most important room in any house) I am set to get blogging again. I’m very aware that there’s a lack of sweet things on this blog. I must make amends. Also, I had an idea to do a series of recipes involving quintessential Scottish ingredients…such as raspberries! This is a replication of the brownies that Marc made at Wedgwood last week; I used Hugh Fearnley Whittingstall’s basic brownie recipe as a basis. For chocoholics this is a truly indulgent affair, and combined with a gorge of fresh summer fruit in the form of juicy raspberries it’s brilliant. A fantastic marriage of flavours. 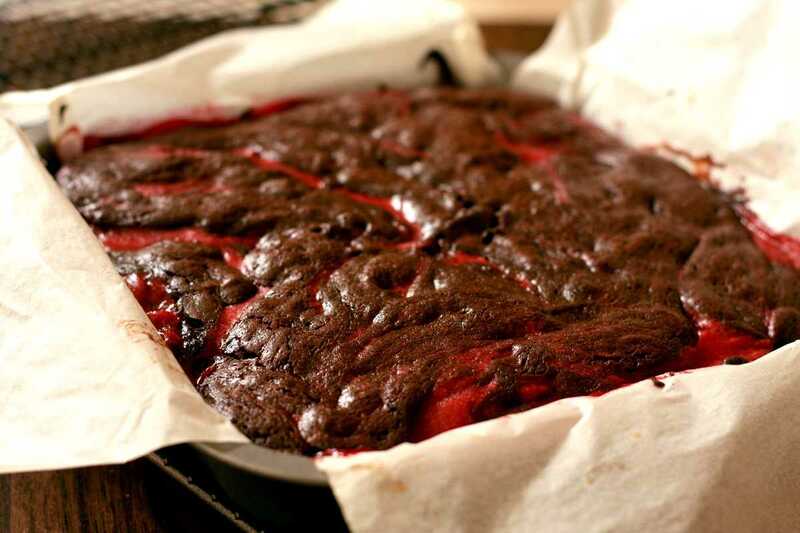 The brownie should be shiny and cracked on top, hiding the heavenly soft centre which any brownie lover craves. Heat the oven to 160C/Gas 3. Grease a 22x22x5cm brownie tin and line with two strips of baking parchment, letting the sides hang over the edge to make removing the brownies easier. Firstly, prepare the raspberries: place the raspberries in a blender and purée. Sweeten to taste with icing sugar. Pass the mixture through a sieve to remove the seeds. Set aside. Place the butter in a saucepan and melt over a medium heat until it turns brown and develops a nutty aroma. Set aside to cool. Using an electric hand mixer, beat together the caster sugar, light muscovado sugar and eggs until thick and glossy. The ribbon of batter should be visible on the surface for several seconds when you lift up the whisk. Beat in the vanilla extract and the browned butter. Sift the cocoa powder and plain flour into a separate bowl. Gently fold this into the egg mixture with a spatula. Scrape about half of the mixture into the prepared tin, then spoon dollops of the raspberry purée on top. Scrape the rest of the brownie mix on top, and stir the mixture slightly to create a marble effect. Place in the oven for about 25 minutes, or until a toothpick comes out of the middle of the brownies with a few moist crumbs attached.